Originally posted by creator of the Vision Council Katherine Allen on her blog “the accessibility portal” on February 16, 2016. In 2012 I started a conversation with Teresa Jaynes, a friend and Philadelphia artist, about an advisory position on a project she was working on with at the Library Company of Philadelphia (LCP). Well, actually, she started the conversation with me, by calling one day very intrigued with working on this project, which entailed reflecting on the Michael Zinman Collection of Printing for the Blind and production “something”, not sure at that time what that would be. The project that resulted was, The Moon Project, a 2014 multisensory exploration of “Moon”, a font designed by a British educator, Dr. William Moon in 1845, for those late to lose their sight. 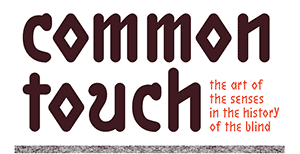 And next— by way of a much more in depth study of the Zinman collection at LCP—Common Touch, The Art of the Senses in the History of the Blind, to open April 4th at The Library Company, 1304 Locust Street, Philadelphia. This is where the Vision Council comes in the picture. At artist Jaynes’ request, I gathered a group of people with a wide range of visual acuity, to “counsel” and advise her during the project. Ranging from totally blind at birth to myself, an early onset person with macular degeneration. The Vision Council is comprised of people I know professionally, (that does overlap into the friendship realm-they are such fabulous individuals!). They are: Dorrie Rush, Director, Henry A. Grunwald Technology Center, at the Lighthouse Guild in NYC, Henry Butler, a Billboard top-50 jazz musician, Suzanne Erb, a choral singer and teacher at Networks for Training in Philly, Edery Herrera, a computer teacher to the blind and visually impaired and a tri-athlete based in NYC and myself, a former corporate Creative Director and now accessibility consultant and artist, having transplanted myself to Philadelphia. In my next several posts I will be introducing the Vision Council members individually and linking you to their audio interviews with the Library Company’s artist-in-residence, Teresa Jaynes. And follow me on twitter: Katherine L Allen @not_quite_blind.